Dover City Park is a place where all residents can come throughout the year and enjoy the outdoors in a safe and clean environment. During the warmer months, the sounds of splashing can be heard from the Dover City Pool that overlooks miles of walking trails, a professional Disc Golf course, eight baseball/softball fields, eight tennis courts and two full-size basketball courts. The smell of cookouts fill the air as families regularly gather at one of the many pavilions located throughout the park. During autumn, the leaves on the trees explode with color, making it one of the most popular places in the area to take a walk or go for a bike ride. When snow comes to the Tuscarawas Valley, children of all ages can be found whizzing down Deis Hill on their sleds. Memorial Hall serves as a year-round multi-purpose facility located near downtown. The hall offers a full-size basketball court, as well as a large gathering hall with a kitchen. If you have any questions, suggestions or would like to inquire about any of our recreational facilities or activities, please contact the Parks and Recreation Department at (330) 343-0731. If you have questions or would like to report a problem about Parks and Recreation, call Director of Parks, Recreation and Shade Tree Services Scott Jerles at (330) 343-0731. Scott Jerles also serves as Shade Tree Director. 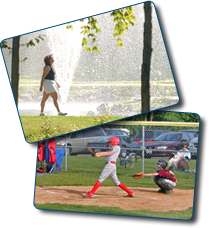 You may also contact the Parks & Recreation Department by sending an email to parks@doverohio.com.